Some Conservatory ! Cornwall The Eden Project consists of two gigantic geodesic biomes, which have been landscaped into a 50 metre deep crater, overlooking St Austell Bay. The Eden Project consists of two gigantic geodesic biomes. Here, you can experience the sights, smells and sheer scale of the rain forest in the humid tropic biome. In the Mediterranean biome, you will have the shade of olive trees and fragrance of the lavender which would have been the backdrop to many Biblical stories.As you stand inside, the sheer scale of the enterprise awes you - as would the nave of a giant and magnificent Cathedral. As you stand inside, the sheer scale of the enterprise awes you - as would the nave of a giant and magnificent Cathedral. 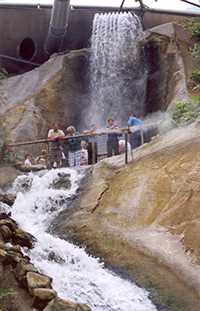 There is the same hushed atmosphere – despite the torrential roar of a natural waterfall on the cliff, which forms the backdrop of the Tropical Biome. However, these “Cathedrals” host, not rows of pews or the sepulchers of the famous who are now history, but in one case a living, vibrant rain forest and, in the other, the growing fruits and flowers of the Mediterranean, South Africa and California.